Here is an alphabetical list of anthologies, contests, and literary journals that are soliciting visual or written work on themes related to military service, or have specifically called for work by military service members, veterans, and/or family members. This list will also appear as a static page on the Red Bull Rising blog. List updated as of Feb. 27, 2015. As part of an ongoing 2015 project working toward an anthology of near-future military-themed science fiction, The Atlantic Council regularly solicits new stories illustrating the military/political world as we're about to know it. Examples: One past flash-fiction contest asked writers to imagine a "Day of Infamy" speech given after an 2041 attack on the United States. A past short-story contest called for stories of 1,500- to 2,500 words, in the form of journalistic accounts akin to a front-page story describing the outbreak of a future great power conflict. Having published four separate on-line annual titles for fiction, non-fiction, poetry, and PTSD narratives in 2013, the Kentucky-based Military Experience & the Arts non-profit in 2014 recombined those publications into a quarterly literary journal titled "As You Were." The title replaces "The Blue Falcon" (fiction); "Blue Nostalgia" (PTSD narratives); "The Blue Streak" (poetry); and the flagship "Journal of Military Experience" (non-fiction and academic writing). Submissions go through a unique peer-editing process prior to publication. Acquires first North American and anthology rights. Previously published materials: Yes, with notice. "For those brave and creative souls who have dedicated their lives to the armed forces, for those witnesses to the impacts of war and military life, and for those who crave understanding of the experiences incited by war and aftermaths, Ash & Bones presents a myriad of insightful readings." Submit poems, letters, essays, or short stories in response to the following themes: Letters from War; War Stories; Human Waste; Military Life; Military Afterlife. Published by the Veterans PTSD Project of the non-profit Military Experience & the Arts: "Blue Nostalgia gives us a medium to connect to our brothers and sisters, while allowing the civilian community a glimpse into our world. There are many of us who have experienced the trauma that comes with armed conflict, but there are many more who have not, and never will. We veterans hold in our minds and bodies the history of our wars, and if the non-veteran community is to grasp who we are, what we have experienced, and what we are capable of as productive citizens, we must tell our stories. In addition to experiencing war trauma, some of us have experienced military sexual trauma or trauma outside of a deployment. The stories of such trauma and the growth that follows need to be told." "Consequence is an international literary magazine published annually, focusing on the culture and consequences of war. " Madison, Wis.-based Deadly Writers Patrol was started by a cadre of Vietnam War-era veterans, but issues since 2013 have included work from veterans of all eras. The magazine's editors welcome veterans' contributions of poetry, fiction, and more. Submissions by non-veterans should regard in some manner a theme of war or its effects. In addition to short stories and poems, past submissions have included excerpts from novels and memoirs, as well as personal essays. From the call for submissions: "The military uniform is a symbol of the service and a tool for the wearer. The accoutraments have meaning, some tell of the wearer's valor, of sacrafice, of loss, of conquest, accomplishment or rite of passage. Some parts are hard won, like the tab on the right shoulder. Some mark a history, like the overseas ribbon on the sleeve. The combat shirt, the bloused pants, belt exact upon the gig line...each part of the uniform has meaning. Each who has worn the uniform has a story. What is your story, with what aspect of your uniform as symbol or character that calls back to your service? Submissions of nonfiction (750 - 5000 words) or poetry (any form, up to 5 poems) wanted. Please include an author's bio under 200 words." The Jeff Sharlet Memorial Award for Veterans contest is hosted by The Iowa Review and made possible by the family of Jeff Sharlet (1942–1969), a Vietnam veteran and anti-war writer and activist. The contest has been conducted in 2012 and 2013. The contest is open to any service member or veteran writing in any genre, about any subject matter. Entry fee is $15. Prize is $1,000 and publication in The Iowa Review. Entrants should submit a double-spaced manuscript in any genre (poetry, fiction, creative non-fiction) of up to 20 pages. Limited to military service members, veterans, and/or families? Copy of DD-214 or military identification card may be required after acceptance. First published in March 2013, the Line of Advance is a quarterly e-journal of writing by military veterans and service members. Future issues may be organized around themes. "We're looking for creative work that is authentic to the individual veteran's experience," co-editor Matt Marcus says. "We ask that people not write or express what they think other people want to read, but write what they want. Something amazing happens when creative writing really conveys personal narrative." The Veterans Writing Project is a Washington, D.C.-based non-profit that pursues a double mission: Provide writing-as-therapy resources to injured military veterans and the medical community, and, more generally, encourage and publish the literary work of military service members, veterans, and family members. In Summer 2012, the organization announced a literary journal titled "O-Dark-Thirty." Works published by an online journal are considered for print publication in a quarterly review and/or annual anthology. Payment: Complimentary author's copy. Accepts fiction and non-fiction up to 5,000 words, and poetry up to 3 per submission. Acquires first North American and anthology rights; requests subsequent publication cite the journal as original. First published in February 2013, The Pass in Review is an on-line journal dedicated to presenting veterans' artistic work and perspective. "We believe that veterans from all conflicts, past and present, are misrepresented and are underrepresented in the artistic community. Our goal is to cast veterans in a new light by allowing the public to see their work and gain an understanding of the veteran's perspective." The Pass In Review retains exclusive publishing rights for six months after the first publication, and non-exclusive anthology rights after that. After six months has elapsed, the artist resumes full ownership of his/her work. Published by the Southeast Missouri State University Press since 2012, working in conjunction with the non-profit organizations Missouri Humanities Council and Warriors Arts Alliance, the "Proud to Be" anthology series comprises both a contest and a publication. Prize in each category is $250. "[T]his series of anthologies preserves and shares military service perspectives of our soldiers and veterans of all conflicts and of their families. It is not only an outlet for artistic expression but also a document of the unique aspects of wartime in our nation's history." From the call for submissions: "Seeking personal accounts of actions or experiences of serving LGBT military members and their families on 20 September 2011, effective date of the Don’t Ask, Don’t Tell (DADT) repeal and their experiences throughout the first year until the Anniversary date of 20 September 2012." First published in November 2012 by the Kurt Vonnegut Memorial Library, Indianapolis, Ind., So It Goes accepts new and previously published fiction, non-fiction, poetry, and artwork. Submissions are limited to one work of prose (maximum 1,500 words) or up to five poems, photographs, and/or works of art. Past themes include "War and Peace" (2012); "Humor" (2013); "Creative Process" (2014). While not specifically linked to topics of war or remembrance, the journal's annual publication coincides with Kurt Vonnegut's Nov. 11 birthday, and is part of the library's "Veterans Reclaiming Armistice Day" activities. As a U.S. Army soldier during World War II, Vonnegut was taken as a prisoner-of-war, and witnessed the destruction of Dresden, Germany. Deadline: TBD; between April and August? Starting with the 2013 issue of Stone Canoe, the Institute for Veterans and Military Families (I.V.M.F.) at Syracuse University presents an annual $500 prize for previously unpublished short story, essay, creative non-fiction (up to 10,000 words), or poem (or series of up to three) written by a U.S. military veteran. The subject matter of the submitted work may be about veteran or military family issues, but it is not a requirement. Also, unlike other Stone Canoe categories, there is no requirement that the writer or artist demonstrate a geographic tie to upper New York state. Hudson Whitman/Excelsior College is looking for non-fiction stories from military service members, veterans, and family members and friends that capture the experience of coming home from war. Prize is $200 plus publication in anthology titled "Stories of Coming Home, the Personal Aftermath of War." Project manager Dario DiBattista is the non-fiction editor for O-Dark-Thirty, the literary journal for the Veterans Writing Project. Word count is between 1,500 and 6,000. Limited to veterans? "Authors should have some relationship and connection to the war. 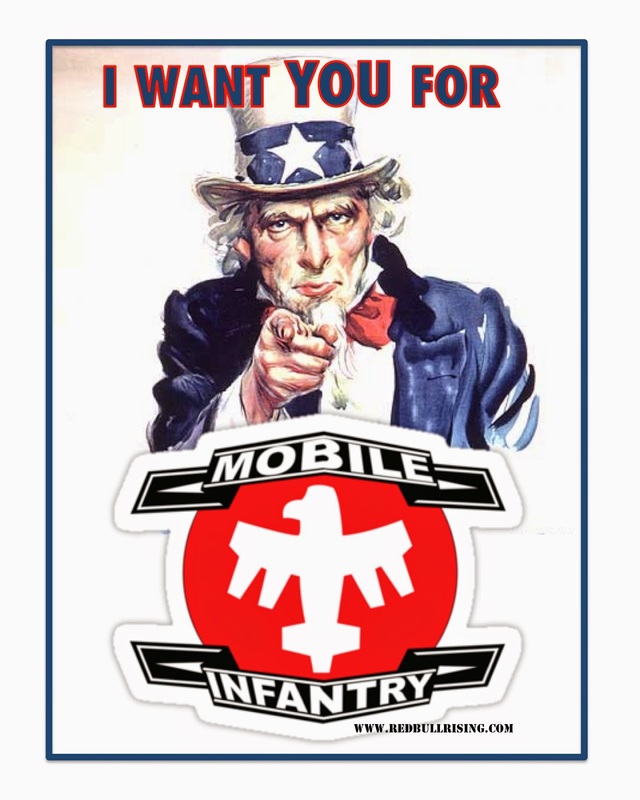 Military veterans are especially encouraged to submit." Organizers at Swords to Plowshares, a community-based non-profit group that serves more than 2,000 military veterans in the San Francisco, Calif. area are calling for artwork for an exhibition titled, "Celebrating Women in Service, Honoring Their Sacrifice." Organizers seek both visual and written art, created by women service members and veterans, as well as families and friends of women who have served in the military. Deadline is April 15, 2015. Artists who are selected to participate will be notified by April 30. The 7th Annual SHOUT! For Women Veterans! event will be June 11, 2015, Fort Mason Center, 2 Marina Boulevard, San Francisco, Calif. 94123. According to press materials, "SHOUT! is a yearly event to celebrate women veterans, inspired by the notion that the arts encourage expression, healing, and foster community connection. [...] This event attracts hundreds of veterans and supporters to share in the artistic expression of women veterans through photography, painting, mixed media, and the written word." On-line galleries of previous shows are available here. Early submission is encouraged. Space is limited. Incomplete submissions will not be considered. Assistance in transporting and displaying art may be awarded to out-of-town artists and disabled artists. Accommodations for oversized pieces of art as space permits, but this is not guaranteed. Organizers will consider contributions from women who are serving in the military, women veterans, spouses, siblings, parents or friends who have been directly impacted by a the service of a woman. Works of art must align with this year’s theme: "Celebrating Women in Service, Honoring Their Sacrifice." Works of art must include an artist statement that expresses the nexus between your art and your military service or how you were impacted by a woman who served in the military (200-word max.). Attach a short biography (75-word max.). Submit a digital photo of artwork (JPEG, PNG or PDF). Submit a high-resolution (300 dpi minimum) photo of yourself for the website, social media and the event program. Submit a photo of the woman veteran during her time in the military for photo slideshow (optional). All artwork must be identified with the artist’s name, address, email and phone number clearly printed on a label attached to each piece. Frame or otherwise make artwork ready to hang or display. An on-line application form is here. A Facebook page for the SHOUT! event is here. A Facebook page for Swords to Plowshares organization is here. Contest: Can You Write the Next 'Starship Troopers'? The next phase of the Atlantic Council's ongoing "Art of Future Warfare" project calls for short science-based stories about conflict in space during the final decade of the 21st century. Word count is 2,000 to 4,000 words. Deadline is March 31, 2014. Authors may publish under a pseudonym, but a biography is required. Best-selling science-fiction writer David Brin will help select the winning entry. Announcement of a winner will be April 20. The writer of the winning entry will be provided travel expenses to attend a May 18 event in the Washington, D.C. area hosted by the Atlantic Council, at which Brin will also be present. The theme of the event will regard conflict in space. Discussions about the future of warfare are often limited by the temporal boundaries faced by national security planners. A lucky few world builders are able to range farther than their peers, yet they rarely push out beyond two decades. This contest will go farther yet to consider the future of armed and social conflict in space during the final years of this century. The best stories will be relevant to readers of today—and tomorrow. Jules Verne's "From the Earth to the Moon" was written in 1865, after all. Beyond Earth is a blank canvas, the ultimate tabula rasa, where even today’s understanding of physics need not apply in the right writer's hands. All can be made anew. Yet in the same way a black and white photograph focuses our attention on living beings in an image devoid of rich color, the off-world realm gives a limitless tableau for mankind’s altruistic ambitions and far fewer places to conceal its baser qualities. This tension between our best and worst is elemental in science fiction because technology is often used as the broker of this duality. From there memorable characters emerge, even if they are not always human. All entries will be considered for inclusion in the tentatively titled on-line anthology, "War Stories from the Future," scheduled to be published in fall 2015 by the council's Brent Scowcroft Center on International Security. For more contest details, including writing guidelines and prompts, visit the Art of Future Warfare project page here. New York City-based Voices from War will conduct a fourth series of free weekly writing workshops for military service members, veterans, and family members. The Winter-Spring 2015 workshop will meet most Tuesdays, 7 to 9 p.m., from Feb. 24 to May 19. There will be no sessions on April 7 and 14, and May 12. The workshop is hosted and supported by 14th Street Y, 344 East 14th St (between 1st and 2nd Avenues), New York, N.Y. 10003. Founded in 2013, Voices from War seeks to empower veterans to craft their own stories, whether for themselves or for broader audiences, in forms both fiction and non-fiction. In this workshop, we write our own narratives, while reading excerpted fiction and non-fiction by veterans, military spouses, and select civilians. Each week, we share student work, learning from each others' strengths and successes, while also discussing ways we can come closer to the stories we want to tell, whether just for ourselves or for a larger audience. The course is team-taught by two writers, a civilian and a veteran. Kara Krauze, who has published in Quarterly West; Center: A Journal of the Literary Arts; Highbrow Magazine; The Daily Beast; Hypothetical Review; the Los Angeles Review of Books; and elsewhere. Krauze has an undergraduate degree from Vassar College in International Studies, and a graduate degree in in Literary Cultures from New York University. Her writing, including a memoir and novels, engages with the subjects of war, loss, and memory. She has lived in Indiana, Ohio, and England, and is a longtime resident of New York City. Nathan Bradley Bethea, writer, critic, and a former U.S. Army infantry officer (2007-2014). Bethea left the military to attend Brooklyn College's Creative Writing MFA program in fiction. His work has appeared in McSweeney’s Internet Tendency, the Iowa Review, The Morning News, and The Daily Beast. He holds an undergraduate degree in Journalism and French from Indiana University. 1. My grade-school warrior-princess was asking me why there weren't any girl heroes. 2. At a Military Experience & the Arts conference, I heard some comics creators and veterans discuss the art form as a means of exploring military histories, personal wartime experiences, and even emerging trends and technologies. 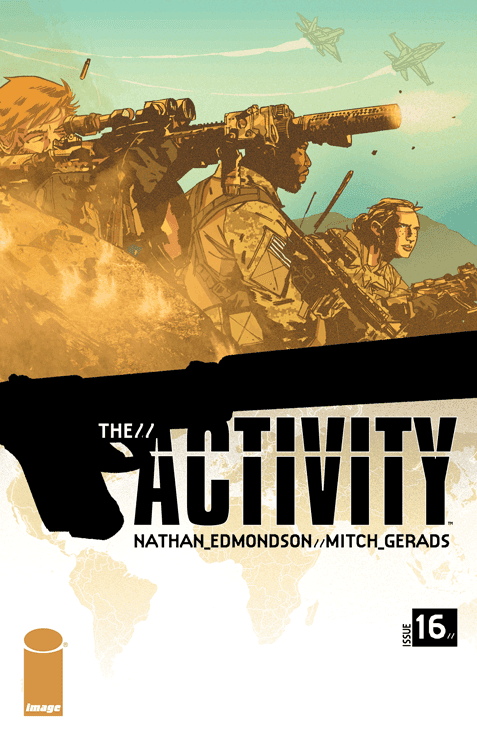 In 2011 and 2012, Image Comics' "The Activity," and DC Comics' "Men at War," and Top Cow's "Think Tank" were my beachheads into the genre of 21st century war comics. Notably, "Men at War" featured a reboot of the iconic World War II-era character Sgt. Rock, who hadn't been featured in his own book since 1988. Each of us had been away too long. In 2012, Marvel Comics launched Fury MAX: My War Gone By a second volume of Fury MAX, in which writer Garth Ennis returned to tell an blood-spattered story that followed Nick Fury through Cuba, Vietnam, and Nicaragua. Not my wars, but certain the backdrops of my childhood and adolescence. The "Men at War" series lasted only seven issues. DC Comics tried again with a dinosaur-filled "G.I. Combat" series and, more recently, with "Star Spangled War Stories, featuring G.I. Zombie." Now, I'm not a purist. War comics make for some strange bedfellows. I'm happy to include elements of horror, alternate history, historical fantasy, super powers, and even sentient chimpanzees in my personal definition of of the genre. For me, the larger question is whether or not they contribute to readers' understanding of the costs, individual and collective, of going to war. I'm not usually attracted to undead story lines, for example, but I think Mark Sable's "Graveyard of Empires" (2011-2012) is mostly successful in its gritty depiction of counterinsurgency, defense contracting, and nation-building in Afghanistan. If the presence of zombies in the story helps expose readers to questions regarding U.S./NATO involvement there, so much the better. War comics, bottom line, should be a big G.I. tent. As a middle-aged journalist and historian focused on modern-day conflicts, however, I find myself motivated more by projects that are more founded in reality. War is strange and beautiful and nasty enough, without adding literal demons. Take, for example, Ennis's history-infused "War Stories" (DC Vertigo); "Battlefields" (Dynamite Entertainment), and the current ongoing "War Stories" (Avatar Press). And the work of artist-veterans, such as Will Eisner's "Last Day In Vietnam" (2000) and Joe Kubert's Dong Xoai, Vietnam 1965 (2011) . I'm also drawn to comics journalism about war and the edges of conflict, such as David Axe's War is Boring" and Joe Sacco's collection "Journalism" . 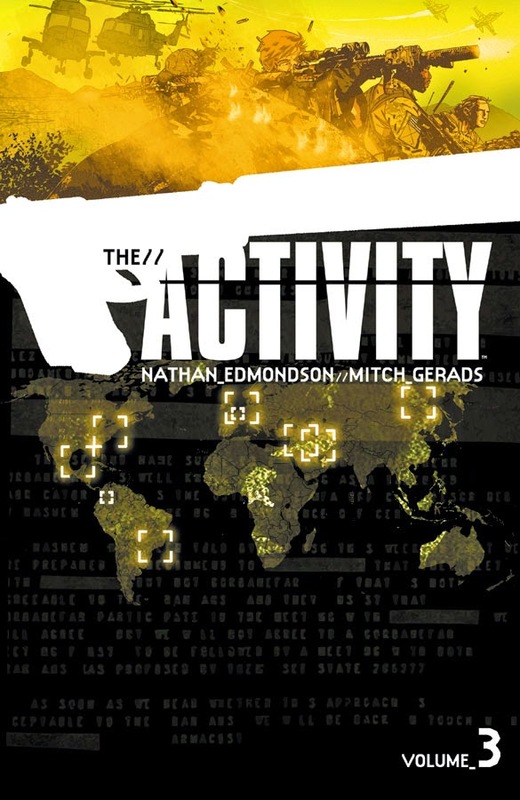 All this pull-list pedigree leads me back to "The Activity"—written by Nathan Edmondson, drawn by Mitch Gerads—which started me on this comics journey, and which apparently has concluded as a series with a double-sized issue No. 15. Given the creative team's commitments to a couple of Marvel NOW titles, readers of "The Activity" had to wait 14 months between issue Nos. 15 and 16. It was worth it, and I appreciated the creators bringing home a bit of closure. If it's not completely over, the series is at least reportedly on an extended hiatus. Or, as soldiers might call such a thing, a "tactical pause." If you're not into collecting monthly "floppies," the third volume of the series is now available in trade paperback. The first trade paperback is here . The second is here . Throughout the series, Edmondson and Gerads got an awful lot right. The primary thread followed Team Omaha, a 5-member special forces team from the military's Intelligence Support Activity. The tone was realistic and plausible, without sacrificing drama and story. Think of it as a tactical-vested "Mission: Impossible." In keeping with the series' tagline, "warfare without warning," Team Omaha hid both in the shadows and in the great wide opens. Then, it decisively brought the hurt. In one notable story, Team Omaha even deployed to American soil. In issue No. 11, the team has to track down a bomb hidden in Minneapolis. That story hit close to home, and explored briefly the realities of our post-9/11 world, without feeling alarmist, jingoist, or pessimistic. There were lots of names in "The Activity." Lots of teams. Lots of agencies. You needed a playbook to figure out who was doing what to whom, who was on the injured list, and who was still in the game. Helpfully, each issue provided a network diagram depicting the status of each character. Those pages reminded me of tracking charts I'd used in the military, working in Tactical Operations Centers. The dialogue was right. There were jokes. There were things left unsaid. There was quiet understanding of where you'd been, and where you were going. This was how soldiers and veterans talk with each other, and relate with each other. In life, and in death. The weaponry, vehicles, and military equipment were correct, too. Anyone who's familiar with Gerads' depictions of Marvel's The Punisher, and with Edmondson's writing in both the current Punisher and Black Widow series, will recognize the realism they bring to their craft. This is how gear looks. This is how gear is used. After all, nothing breaks down the Fourth Wall for a veteran faster than a badly drawn tank. Throughout the series, the colors on page were practically jazz—part of the mood, providing the movement from scene to scene, and the visual fireworks of splash and bang-bang. Essentially, the application of color was its own character in "The Activity." It became part of the book's terrain, the weather, the environment. (I was continually reminded that Army briefs such factors under the heading of "enemy situation.") Those responsible included colorists Andy W. Clift, Jon Scrivens, Joseph Frazzetta. And, finally, I should call out at least one of the characters. I have a soft spot for Leslie Ryan (Callsign: "Fiddler"), a red-haired Army sergeant that is part of Team Omaha. She's a strong, capable, and, most of all, realistic female protagonist. I'd be proud to have her on my team, or to be on hers. When I was in uniform, I encountered plenty of such soldiers, male and female. So, if my daughter ever asks about my war comics—when she's much, much older, of course—I'll happily share with her "The Activity." I hope that it will ignite a conversation. A conversation about how war is hell, and how we should try to avoid it. And about the human stories that happen, when we don't. Drew Cameron, co-founder and director of the San Francisco-based Combat Paper Project, will discuss with the public his work as a fine art papermaker, printer, and book artist. The event will be hosted by the University of Iowa Center for the Book, and will take place in Meeting Room A of the Iowa City (Iowa) Public Library, Thurs., Feb. 5, at 5 p.m. More information is here. Cameron is a U.S. Army veteran who served from 2000-2006. Through Combat Paper workshops, he teaches other military veterans how to make paper out of discarded uniforms. He also works with the Warrior Writers national non-profit, in teaching veterans how to collect and construct books containing their art and writing. The Combat Paper Project is dedicated to using hand papermaking as a way to help veterans come home from war. By working in communities directly affected by warfare and using the uniforms and artifacts from their experiences, a transformation occurs. Through papermaking workshops, veterans use their uniforms worn in service to create works of art. 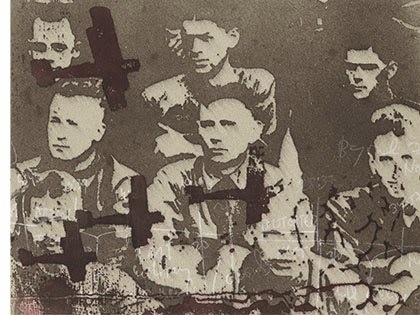 The uniforms are cut up, beaten into a pulp and formed into sheets of paper. Participants use the transformative process of papermaking to reclaim their uniforms as art and express their experiences with the military. Cameron has been operating as an artist-in-residence at the University of Iowa's Hancher arts organization in the week leading up to a weekend performance by Kronos Quartet, who will perform a World War I-themed, multi-media work titled "Beyond Zero: 1914-1918." That performance will take place 7:30 p.m. Sat., Feb. 7 7:30 p.m. at the Englert Theater. For more information, click here. Editors of "As You Were," a literary journal published by veterans- and arts-advocacy non-profit Military Experience & the Arts (M.E.A. ), recently called for submissions of new fiction, non-fiction, poetry, and artwork. In 2014, the organization consolidated its annual fiction, non-fiction, and poetry journals into one quarterly publication. Scholarly articles will no longer be considered. A fourth journal, titled "Blue Nostalgia," collects narratives related to Post-Traumatic Stress Disorder (P.T.S.D. ), and continues under the original name. Guidelines and an on-line submissions tool for that publication are here. The first issue of of "As You Were" is available free on-line here. [...] When you submit prose for consideration, you will first be assigned a "reader" who will read your work, critique it, and provide you with guidance meant to help you meet the standards of your genre's managing editor. When you submit poetry, it will be blind-reviewed by the dozens of authors, educators, and veterans in our reader group. Artwork will be evaluated by our professional art historian and, if chosen for publication, included in an edited collection. When you submit work for consideration a member of our staff may critique it and provide you with guidance to meet the standards of our managing editors, or you may be invited to participate in an online workshop to develop your skills. While we can't promise you'll be published, we can guarantee that you won't be rejected outright and you'll receive some form of consultation. Our approach helps maintain quality standards while giving every contributor the opportunity to improve. Formatting guidelines and editorial suggestions for "As You Were" are here and here. An on-line submissions tool is available here. Military Experience & the Arts also plans a national symposium for military service members, veterans, educators, advocates, and others May 14-17, 2015 in Lawton, Okla. Its first such event was conducted in Richmond, Ky. in 2012.